season runs from April through October with only certain cruise lines being permitted to travel there in order to avoid overcrowding on the island. Major ports of departure for Bermuda cruises include Boston, New York City and Philadelphia. 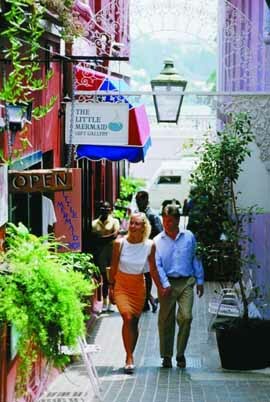 To Couple Shopping in Hamilton, Bermuda experience one of the most quaint, laid-back places on earth, book a Bermuda Cruise Vacation today! Because the speed limit on the island is only 20 miles per hour, it is perfectly safe to explore the different areas on moped or bicycle, but walking is also always an option. Hamilton, the capital of Bermuda, is located on Hamilton Harbor. The town itself sits on hills overlooking the harbor. Sightseeing boats can be seen meandering in and out of the harbor. The Cathedral of the Most Holy Trinity is a wonderful example of English architecture. The church was built with Bermuda limestone while the altar in the Lady Chapel is made of exquisite Italian marble. Visitors who climb the hundred or so steps to the top of the tower will be rewarded with a breathtaking view of Hamilton. Another historical point of interest while in Hamilton is the Museum of the Bermuda Historical Society, which is located in the home of the island&s first postmaster. The Bermuda Public Library is also located in this building. Art lovers should head over to City Hall, which houses both the Bermuda Society of Arts Gallery and the Bermuda National Gallery. The streets of Hamilton are also lined with many interesting shops and delicious restaurants. 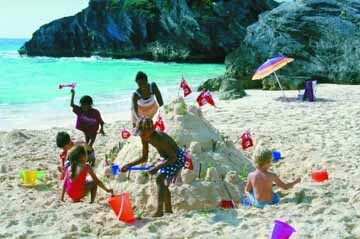 Kids Building Sandcastles at Horseshoe Bay Somers. A Desmond Fountain statue of the Sir George is located on Ordnance Island. The dunking stool mirrors that which was used to punish troublemakers back in the 1600s. After the wreck of the Sea Venture, some settlers built two more ships to carry them onward to their original destination, the Deliverance and the Patience. A replica of the Deliverance is also on display at Ordnance Island. St. Peter's Church is the oldest Anglican Church in the Western Hemisphere that still holds services. A walk through the graveyard will show tombstones dating back to the 1600s. Located on the opposite end of the island, The West End is a nature lover's paradise. Crystal blue waters, white sandy beaches, nature reserves and wooded areas all make this a tranquil place to visit. 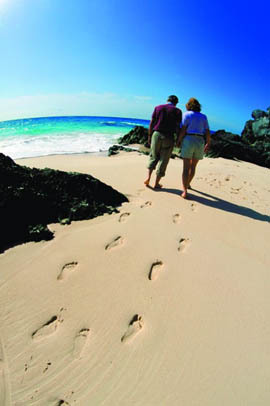 Long Romantic Walk on the Beach in Bermuda Bay Park and Nature Reserve is a great place to spend a day soaking up some rays on the beach or enjoying a romantic picnic. The Heydon Trust Property is open seven days a week and will delight bird enthusiasts, as it is a bird sanctuary. The Royal Naval Dockyard was built in the early 1800s to deter pirates who began to take an unwanted interest in Bermuda. Closed in 1951, the Dockyard now houses a snorkel park, cruise ship terminal, restaurants, shops and water-sports facilities. Although this is a manmade structure, it is a great place to explore some of the island's natural beauty. Whether it is magnificent beaches, nature reserves or historical points of interest, each of the nine parishes has something great to offer vacationers. To get a feel for what the island looks like as a whole, head over to Palm Grove. A map located in the pond shows each of the parishes divided by grass sections. Various Desmond Fountain statues surround the pond. Palm Grove is located in Smith's Parish. Also located in this parish is Spittal Pond. Over 25 species of waterfowl claim this as their home between the months of November and May. Fort St. Catherine, located in St. George's Parish, was built in 1613, although renovations continued well into the 19th century. The underground tunnels make this an eerie place to visit. Bermuda as a whole is also a water enthusiast's paradise. Water related activities include swimming, wind surfing, snorkeling, sailing, deep-sea fishing and diving. Tennis and golf remain the island's most popular sports. Bermuda has something for everyone and vacationers will not be disappointed. 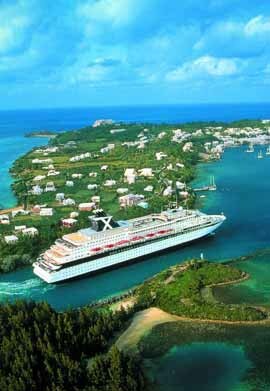 As most cruise vacations to Bermuda last seven days, vacationers will have plenty of time to see and do many things. If seven days is too short, there is always another cruise vacation in your future.